Luxury custom home w/spectacular MT Hood view! 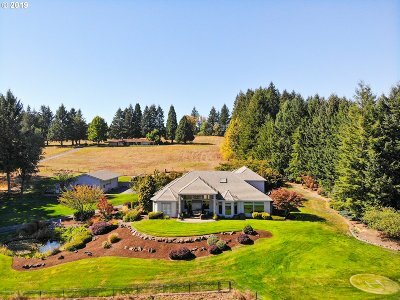 Premium private acreage suitable for horses or vineyard & minutes to Sherwood. Open floor plan; formal living/dining, spacious family rm w/stone fireplace, den/office & beautiful mstr suite all on main. Bonus rm could be 4th bdrm. Fabulous gourmet kitchen. 3 car attached garage plus huge 50x43 shop w/room for RV. Energy saving solar panels on property keep utility expenses at a minimum.